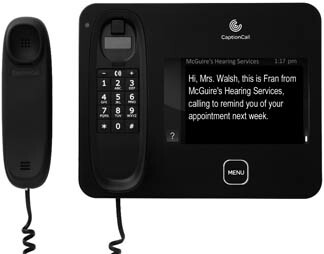 McGuire’s Hearing Aids and Audiological Services has announced that the company has been designated a testing site for the FREE award of CaptionCall Telephone Systems for individuals with a confirmed hearing loss. “There is absolutely no obligation, there’s no fine print, there’s no purchase necessary,” stated David Carr, owner of McGuire’s. “McGuire’s has been selected as an audiology test site, and following the administration of a free test confirming hearing loss, qualified participants will be referred to CaptionCall for the receipt of these free systems,” he added. The CaptionCall System was developed for individuals who have difficulty hearing telephone conversations. CaptionCall uses voice recognition technology and a rapid transcription service to quickly provide written captions of what callers say on a large, easy-to-read screen. Its only requirements are an existing telephone line, high speed Internet connection, and a wall outlet. The unit itself is provided by CaptionCall, with no out of pocket expense to patients. When someone calls in, or when a call is made, the CaptionCall System is used exactly like a standard telephone system. The conversation from the other party will be shown in text on the CaptionCall display so that users can read the details. “All that’s required is that participants receive a hearing test at a local McGuire’s to determine that a hearing loss exists. Once that’s confirmed, and patients receive their results, we will notify CaptionCall and they will contact patients to schedule a system delivery,” said Mr. Carr. “The manufacturers of CaptionCall want to publicize the capability of this unit, and we’re happy to work with them on this,” he concluded.